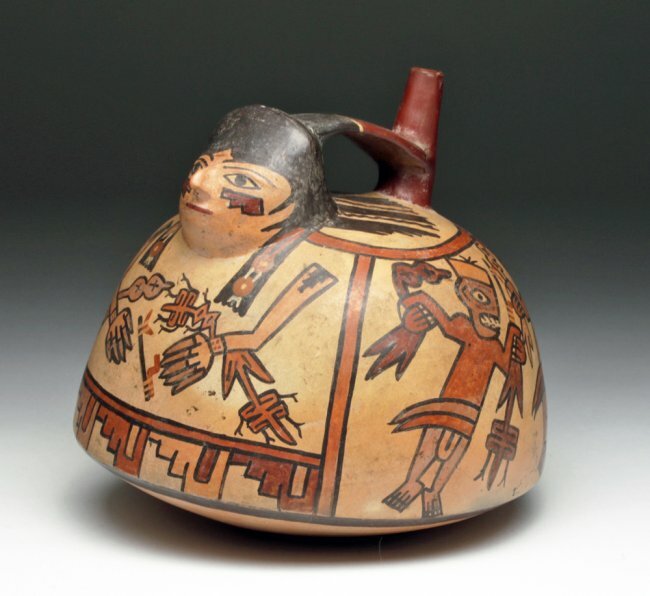 Polychrome Warriors Vessel, Pre-Columbian, Nazca culture, Southern Peru, ca. 200-600 CE. Estimate $1,200 – $1,500. Photo Artemis Gallery. 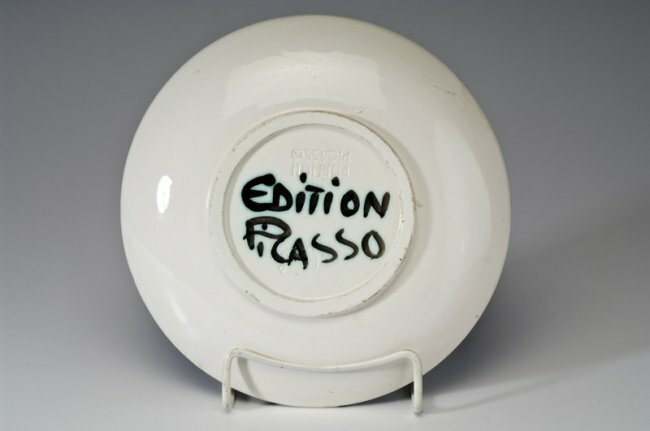 Provenance: Ex-private C. Sobredo Collection, acquired in 1964. 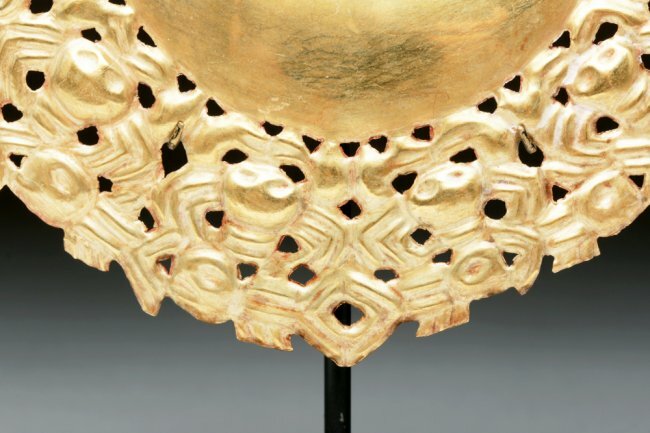 Gold Crabs-Fish Nose Ornament, Pre-Columbian, Vicus, Loma Negra, North Coast Peru, ca. 500-100 BCE. Estimate $7,000 – $8,000. Photo Artemis Gallery. 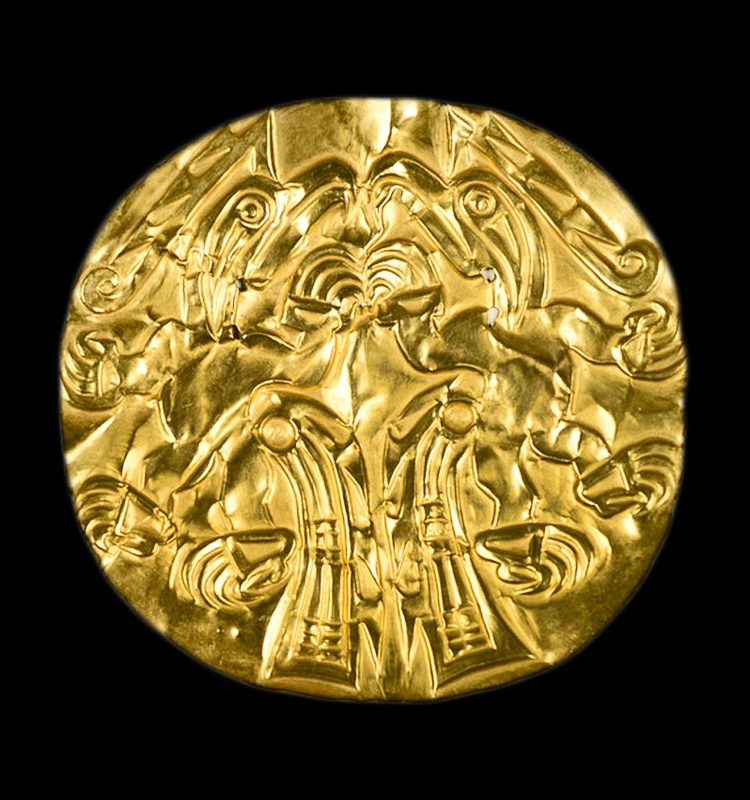 Elegant and large gold nose ornament depicting crabs catching fish in raised relief. Custom stand. 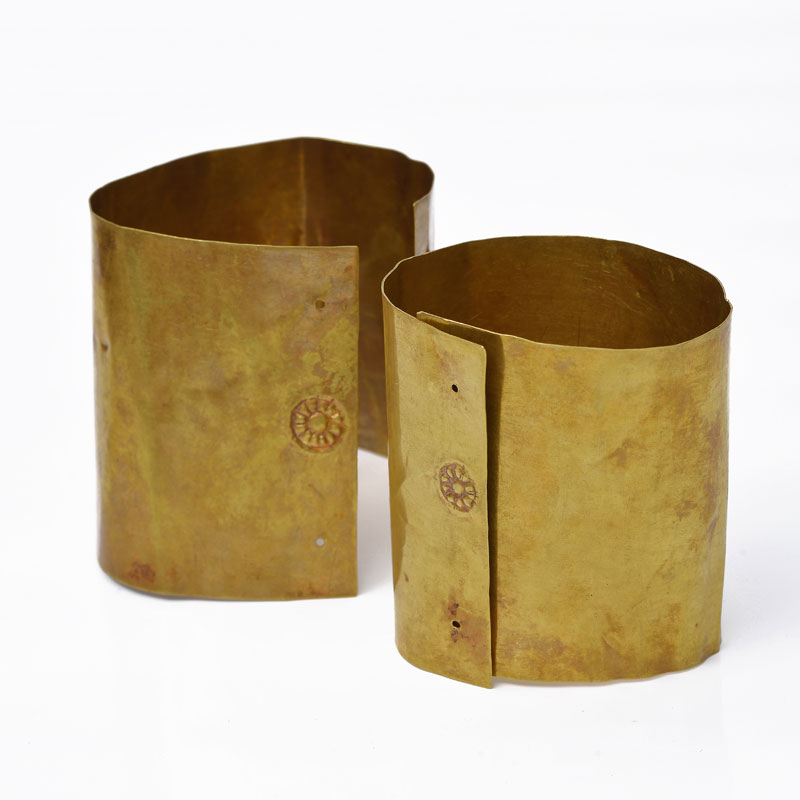 Gold itself measures 4″W x 2-1/2″H. 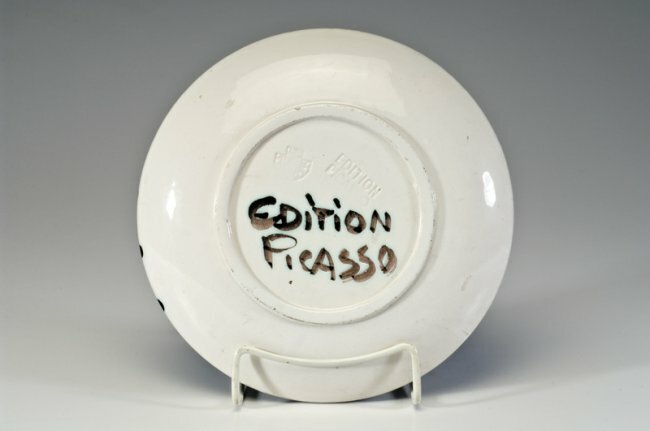 Provenance: Ex-Eugene Lions Collection, Geneva, Switzerland, ex-Arte Primitivo, NYC. 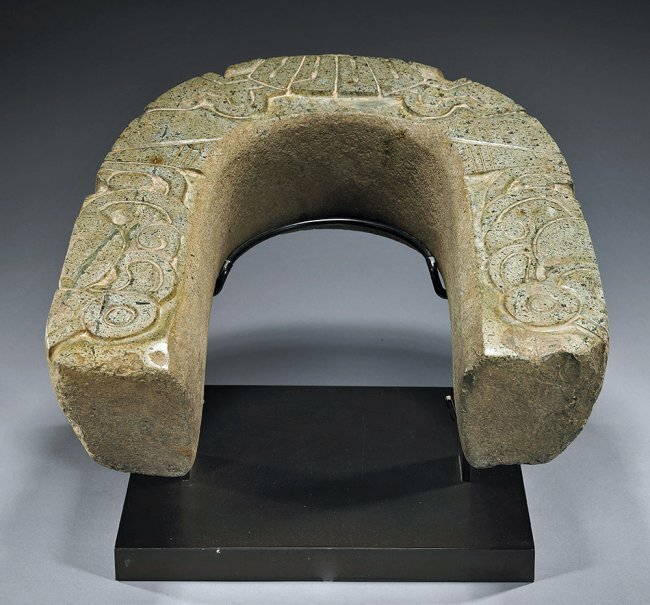 A truly breathtaking green stone yoke, likely a ceremonial representation of a lighter protective guard worn by Mesoamerican ballgame players. Carved in deep relief with human head emerging from the rounded edge, hands and legs to each side. 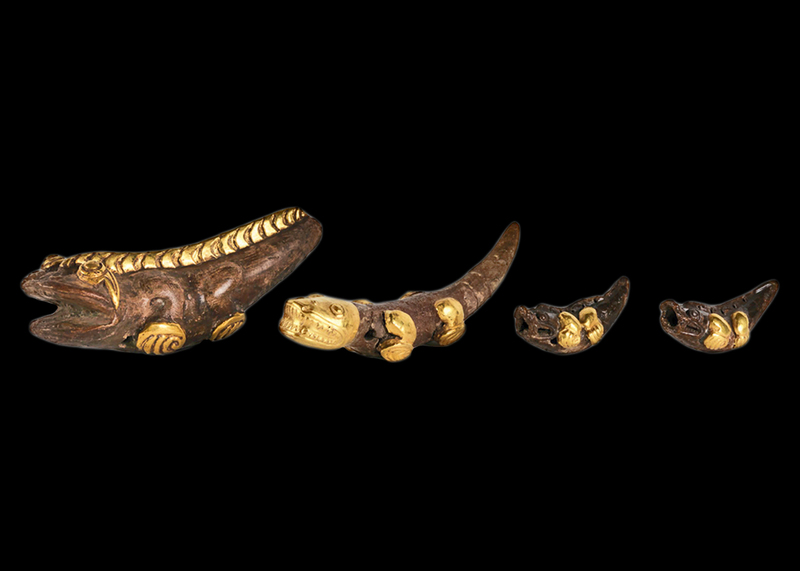 Figure shows almost Olmecoid features with almond-shaped eyes, angular nose and defined lips, wearing earspools with dangling ornaments and collar. Top is further enhanced with scrolling elements of the costume of the lord depicted. Size: 16″L x 15″W x 5″H. Custom museum-quality stand included. Comprehensive laboratory testing was conducted in France by Laboratoire M.S.M.A.P. and confirms all aspects of this piece are consistent with the age represented (13 page testing results and methodology included). The curved shape of the yoke symbolizes a cave, an entrance to the Underworld. 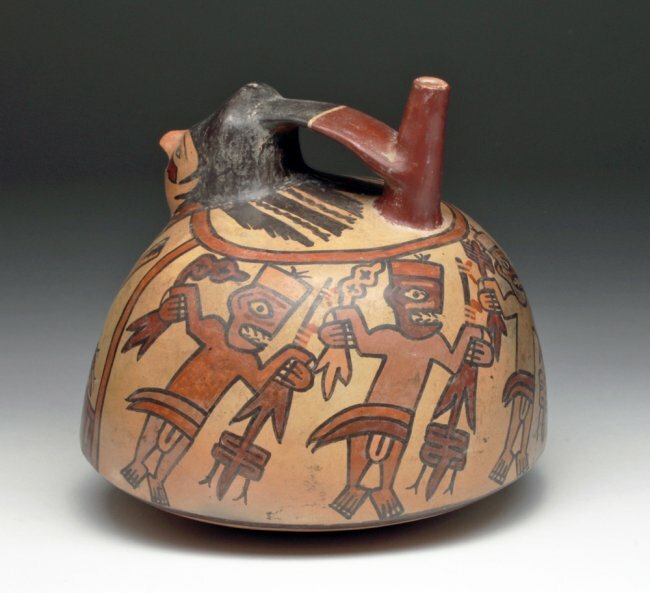 The ritual ballgame was a pervasive religious and political feature of ancient Mesoamerica, the region encompassing most of Mexico and neighboring Central America. The game served to maintain the cosmic balance of the sun and planets, and the cycle of death and rebirth. Provenance: Ex-private Ian Arundel Collection, California. PHILADELPHIA, PA.- For more than a thousand years, a cemetery on the banks of the Rio Grande Coclé in Panama lay undisturbed, escaping the attention of gold seekers and looters. The river flooded in 1927, scattering beads of gold along its banks. 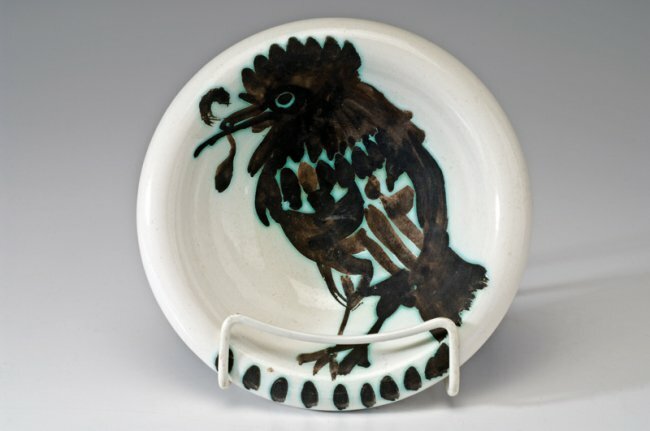 In 1940, a Penn Museum team led by archaeologist J. Alden Mason excavated at the cemetery, unearthing spectacular finds—large golden plaques and pendants with animal-human motifs, precious and semi-precious stone, ivory, and animal bone ornaments, and literally tons of detail-rich painted ceramics. 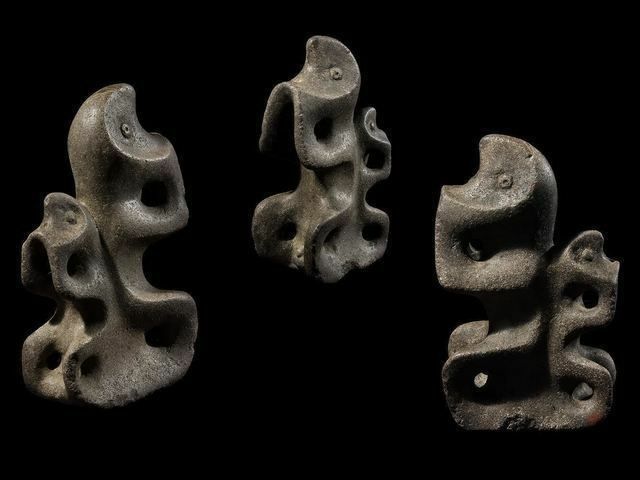 It was extraordinary evidence of a sophisticated Pre-columbian people, the Coclé, who lived, died, and painstakingly buried their dead long ago. 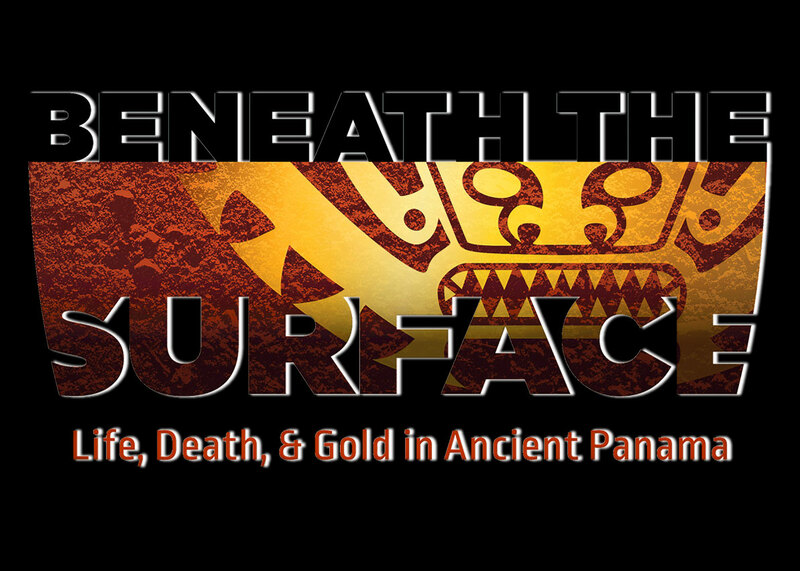 Beneath the Surface: Life, Death, and Gold in Ancient Panama opens at the Penn Museum with a celebration Saturday, February 7, 11:00 am, with a ribbon cutting ceremony, curator talks, Panamanian dance, family crafts, and optional Panamanian menu items in the cafe. 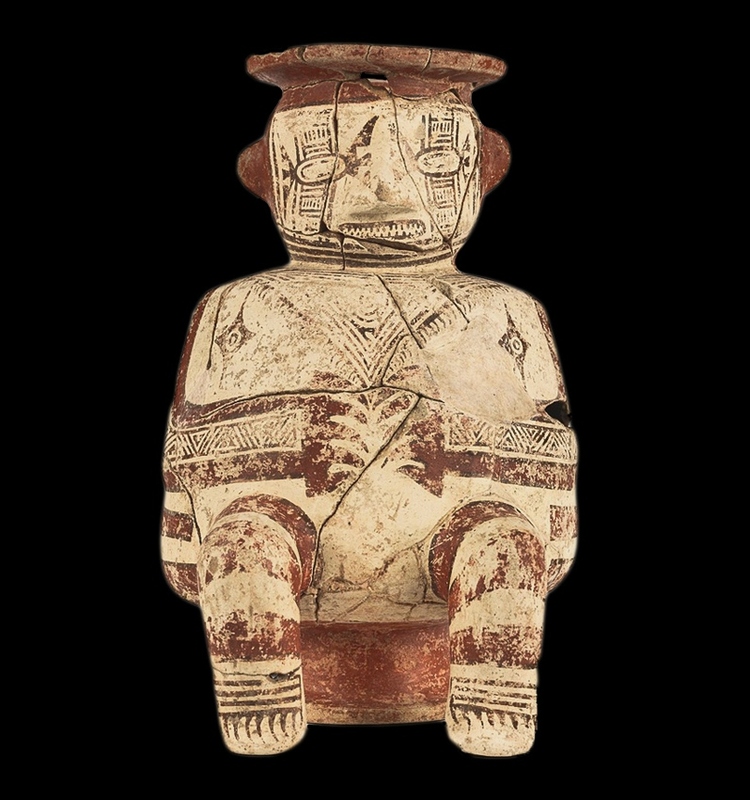 The new exhibition invites visitors to dig deeper, exploring the history, archaeological evidence, and new research perspectives, in search of a greater understanding of the Coclé people who lived from about 700 to 900 CE. Video footage from the original Sitio Conte excavation, video kiosks with opportunities to « meet » and hear from a range of experts, a centerpiece « burial » with interactive touchscreens—and more than 200 objects from the famous excavation—provide an immersive experience. The exhibition runs through November 1, 2015. One massive burial, named « Burial 11 » by the excavators, yielded the most extraordinary materials from the excavation. 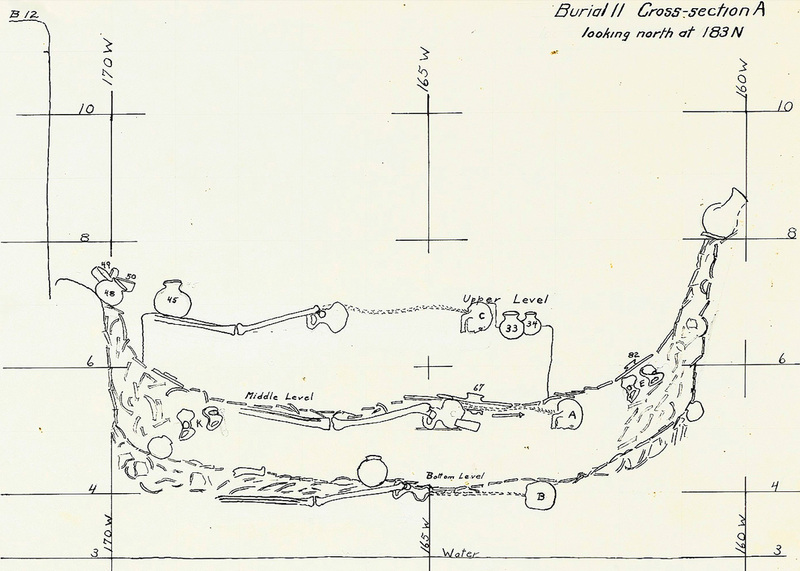 Believed to be that of a Paramount Chief, it contained 23 individuals in three distinct layers, accompanied by a vast array of grave objects. A to-scale installation of the burial serves as the exhibition’s centerpiece, drawing visitors beneath the surface of the site. The re-creation features many artifacts displayed in the actual positions they were found, as well as digital interactive stations for further exploration. The site of Sitio Conte is situated about 100 miles southwest of Panama City. 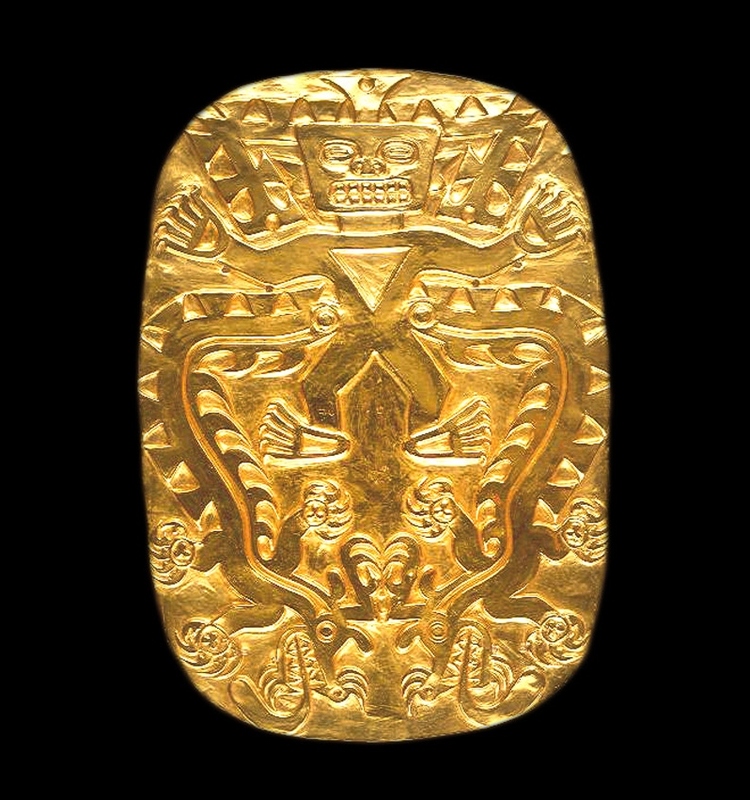 When golden grave goods were exposed on the banks of the Rio Grande de Coclé, the Conte family, owners of the land, invited scientific excavation. The Peabody Museum of Harvard University carried out the first investigations in the 1930s. 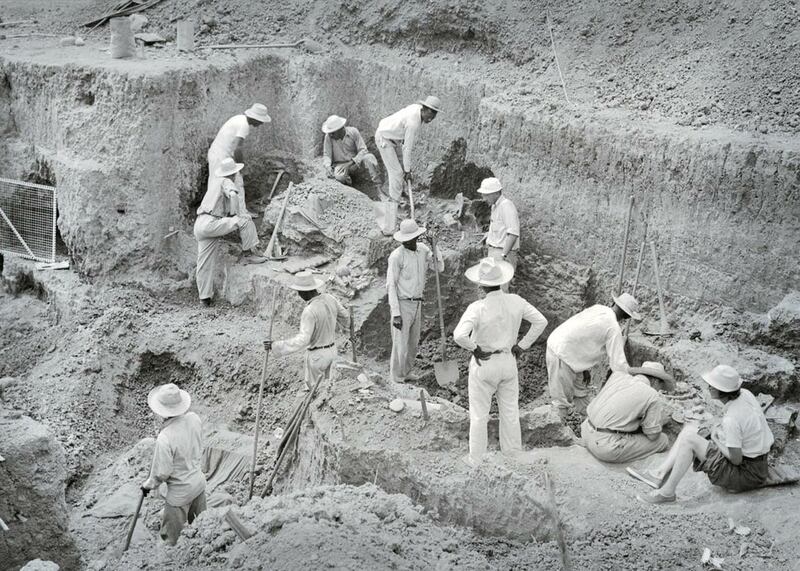 In the spring of 1940, J. Alden Mason, then curator in Penn Museum’s American Section, led a Penn Museum team to carry out three months of excavations. 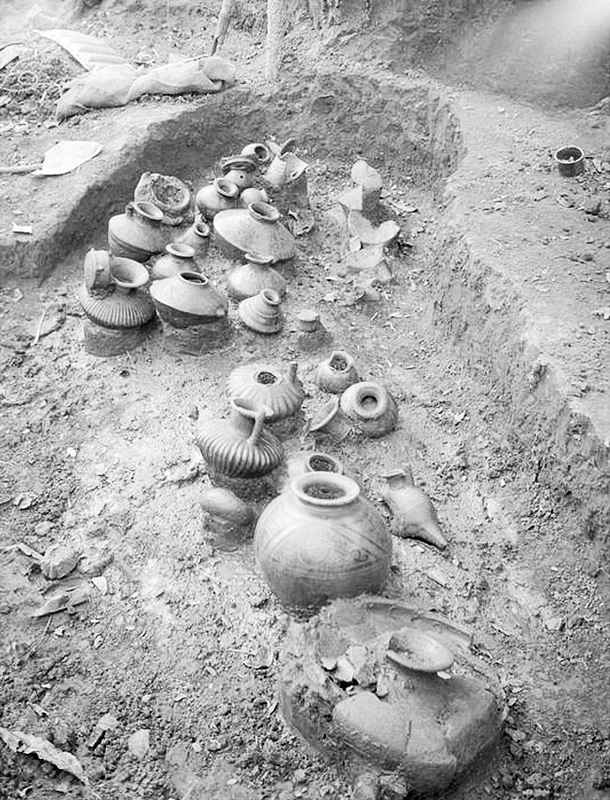 Diary entries, drawings, photographs, and color film from the excavations set the story of the research in time and place. 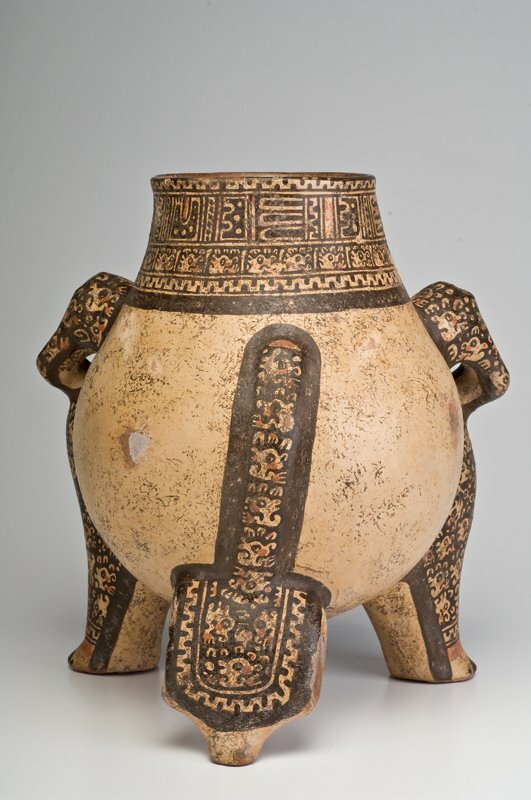 New excavations in Panama, most recently at nearby El Caño, conservation work and laboratory analyses, and ongoing research on Coclé and neighboring Precolumbian cultures, adds to a growing body of knowledge, told through short interviews with Penn Museum and outside experts. 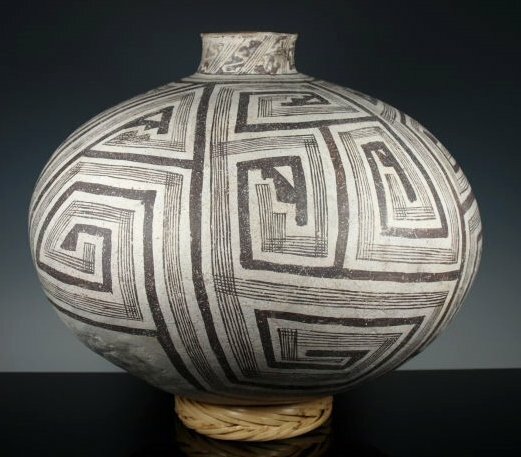 Long overshadowed by research on other indigenous Central and South American peoples, the Coclé remain mysterious, but archaeologists, physical anthropologists, art historians, and other specialists are drawing on the materials they have excavated to tell more. 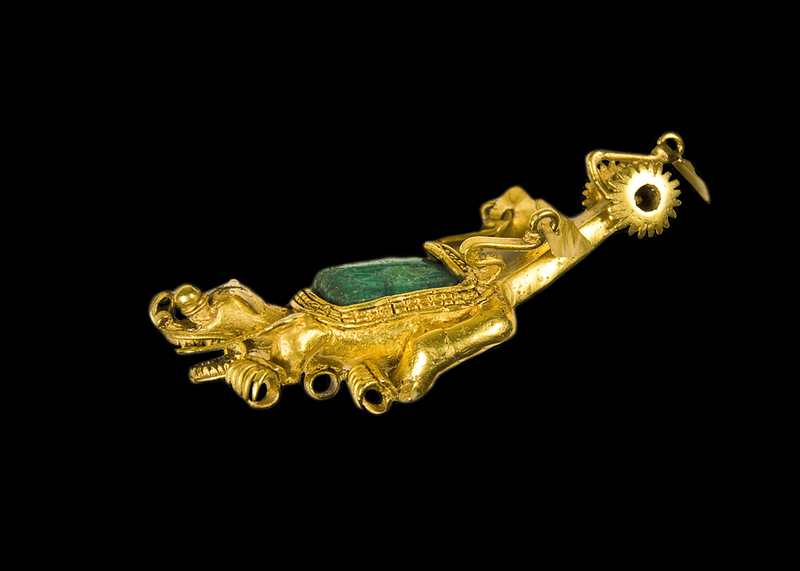 The rich iconography, sophisticated gold working technologies and craftsmanship, exacting placement of bodies and materials in the burials: all offer clues about the world view, artistic style, and social hierarchy of the Coclé. 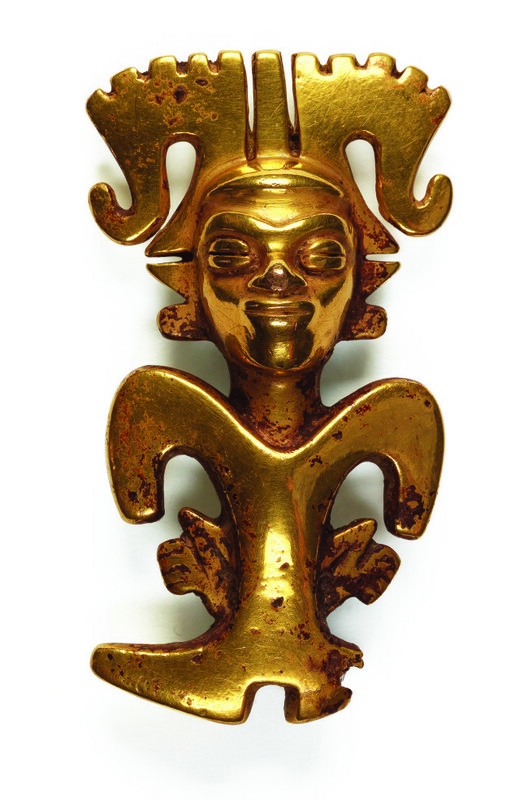 The art and artifacts uncovered from Burial 11 and throughout the Sitio Conte cemetery were rich in cultural meaning and utilitarian value, and Beneath the Surface uses them to begin to create a portrait of the Coclé people. Central to Exhibition Curator Clark Erickson’s vision of « peopling the past » is a contemporary rendering of the central burial’s Paramount Chief; he stands replete with some of the golden pendants, arm cuffs, and plaques, exquisitely crafted and worthy of a great warrior, which he wore to his grave. 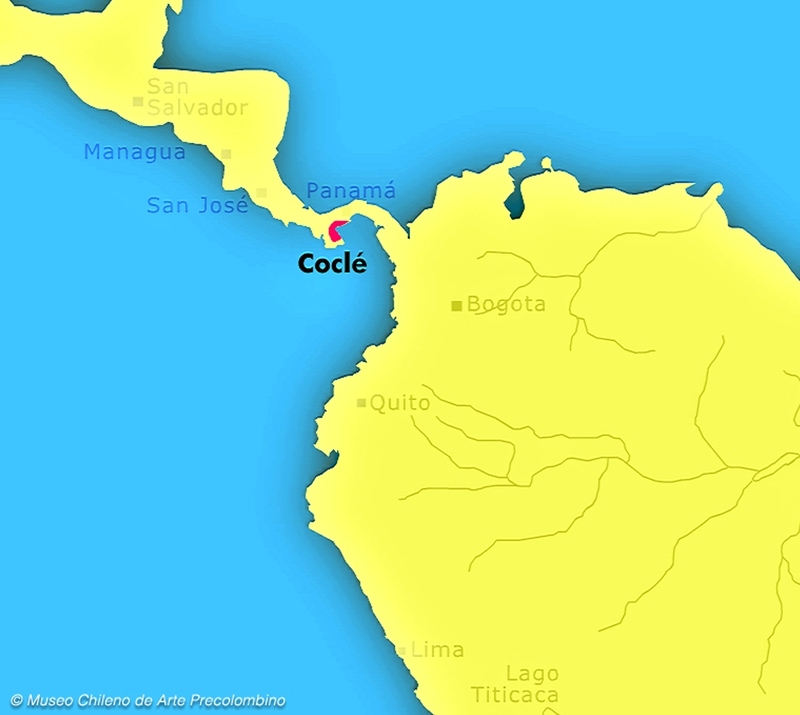 Though not identified as direct descendants of the Coclé, many indigenous groups continue to live in Panama and in the region of Sitio Conte today. 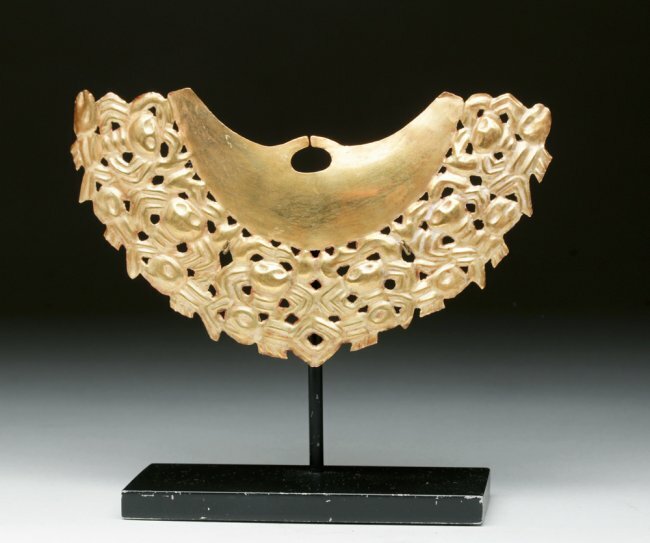 A small section of the exhibition provides visitors with an opportunity to see contemporary Kuna clothing that echoes some of the design forms and styles of ancient Coclé pottery, pendants, and gold. Throughout, visitors can explore the evidence and encounter new perspectives on who these people were and how they lived. Dr. Clark Erickson, Curator-in-Charge, American Section, is the exhibition’s Lead Curator, working with Co-curator Dr. Lucy Fowler Williams, Associate Curator and Sabloff Keeper, American Section; William Wierzbowski, American Section Keeper; and a team of undergraduate Student Assistant Curators, Monica Fenton, Sarah Parkinson, and Ashley Terry of the University of Pennsylvania, and Samantha Seyler of New College, Florida, who provided additional collections and research support. Kate Quinn, Director of Exhibitions and Public Programs, leads the exhibition interpretation and design, working with Christine Locket and Associates (interpretive planning), Alusive Design (exhibition design), and Bludecadet (multimedia design). The exhibition fabrication is provided by Art Guild, Berry and Homer Printing, and the Penn Museum Preparation Department, led by Ben Neiditz, Chief Preparator. Mask with carved stepped pyramid motif,’ 250-450 CE, Throckmorton Fine Art. 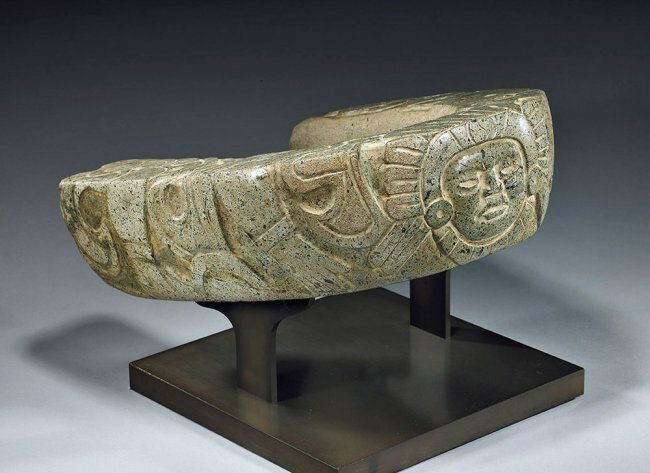 NEW YORK, NY.- Throckmorton Fine Art will be presenting an important selection of Pre-Columbian art and artifacts at the 61st Annual Winter Antiques Show. This is the gallery’s 29th year participating in New York’s best known art fair. Among prized examples of Pre-Columbian art at the Throckmorton stand is a Mayan Middle Classic Mosaic Mask, dating to 600-900 CE. 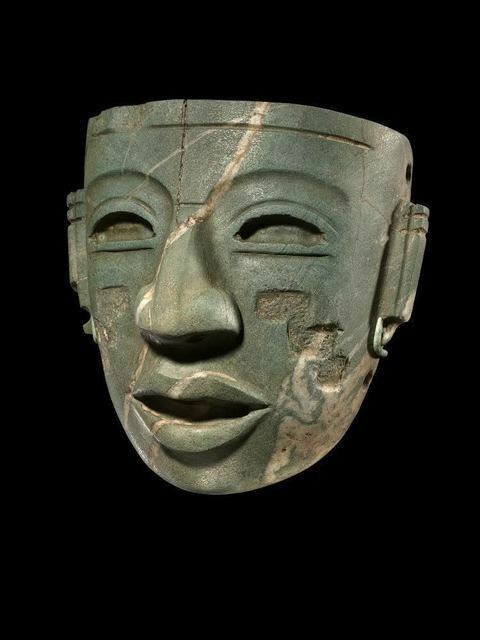 The striking Jade Mask measures 3.5 inches. 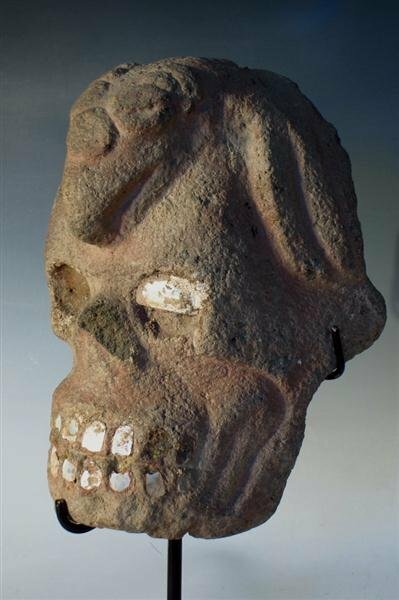 Another important find is a Teotihuacan Mask with a carved, stepped pyramid motif, dating to 250 – 450 CE. It is 8.5 inches high and is made of green marble. 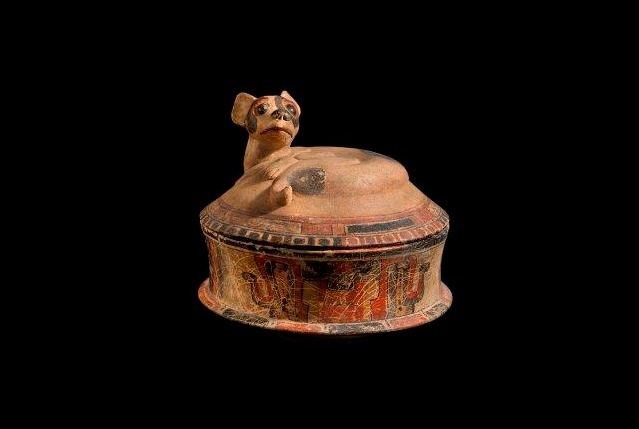 A third attraction at Throckmorton’s exhibition at the WINTER ANTIQUES SHOW this year is a Mayan Dog Effigy Vessel with a removable lid section. 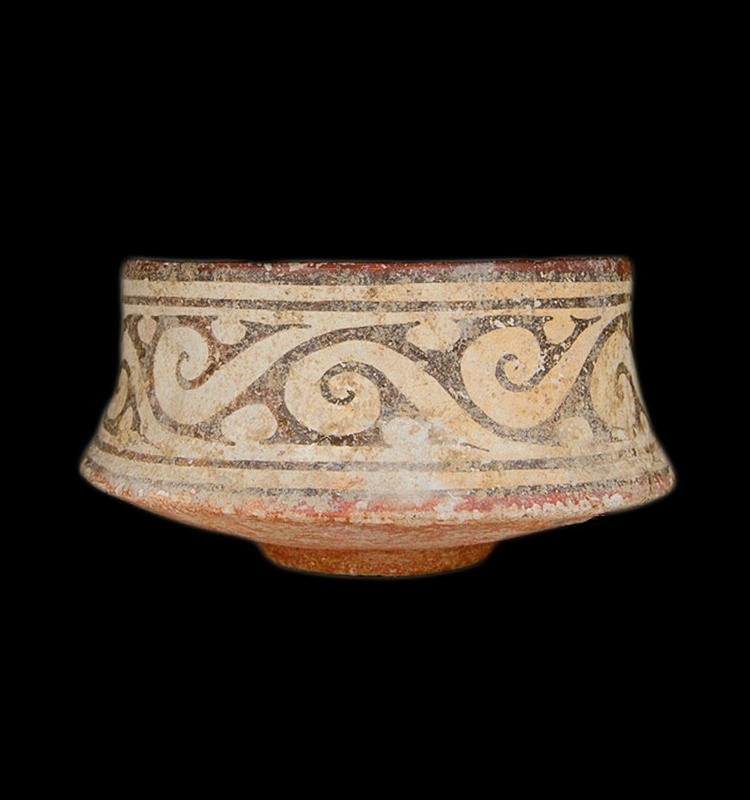 It is polychromed ceramic dating to 600-900 CE and is 11.5 inches high and 13 inches wide. 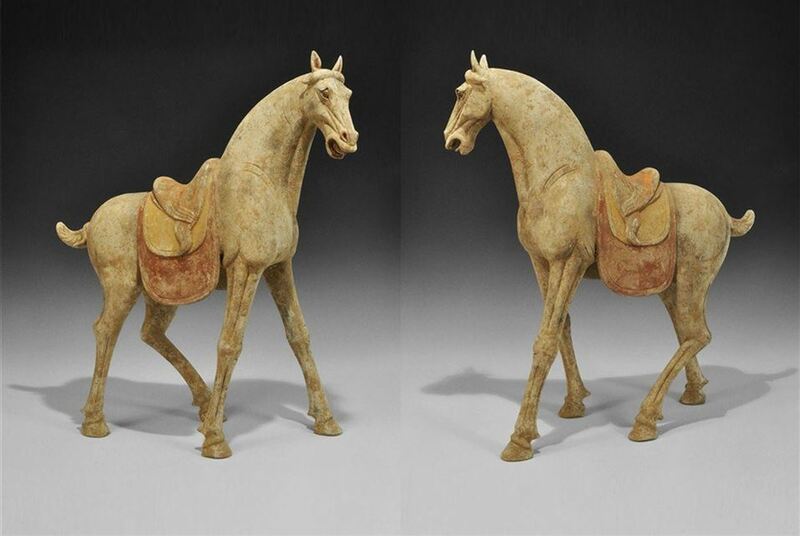 Spencer Throckmorton says, “The Winter Antiques Show has attracted the attention of leading curators and private collectors for decades. As dealers in Pre-Columbian artifacts we are delighted to see the top echelon of connoisseurs and experts in the field visiting our stand at this annual mid-winter event. 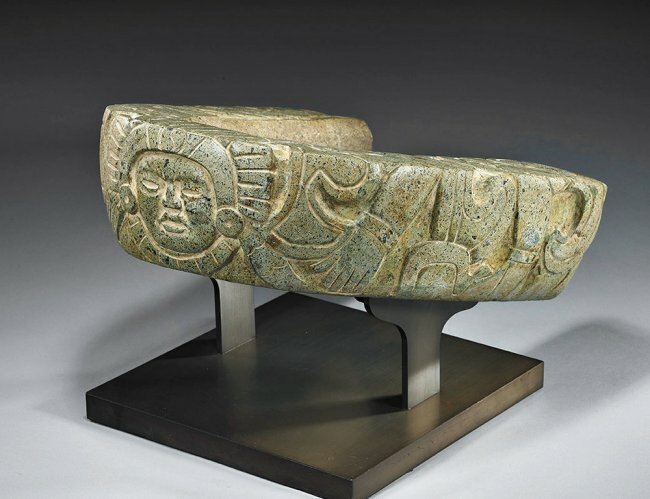 As the premier dealer offering extraordinary pre-Columbian art and vintage and contemporary Latin American photography, Throckmorton Fine Art participates in internationally acclaimed fairs, including The Winter Antiques Show, the Association of International Photography Art Dealers (AIPAD) show and Asia Week in New York. 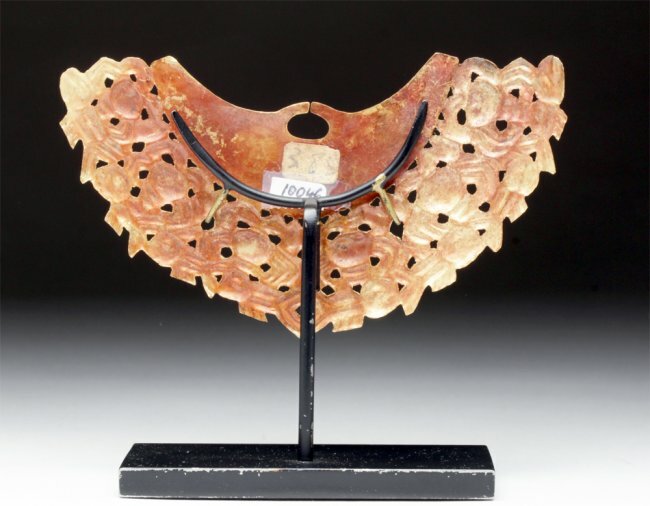 The gallery also showcases fine Chinese jades and Asian art. Kraige Block, Throckmorton Executive Director serves as a member of the Board of Directors of AIPAD. 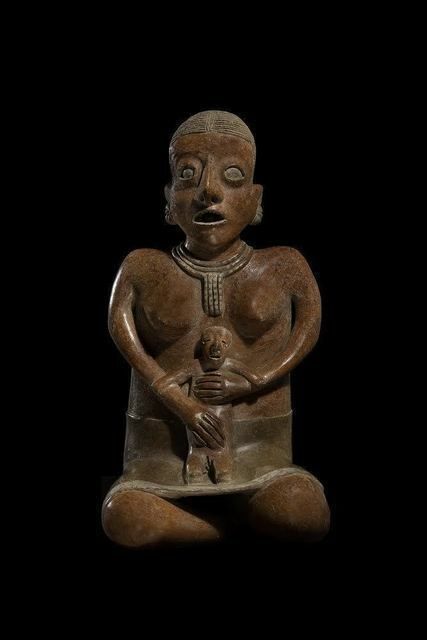 ‘Chinesco, Seated Mother & Child, Proto-classic,’ ca. 100 BCE – 250 CE, Throckmorton Fine Art. 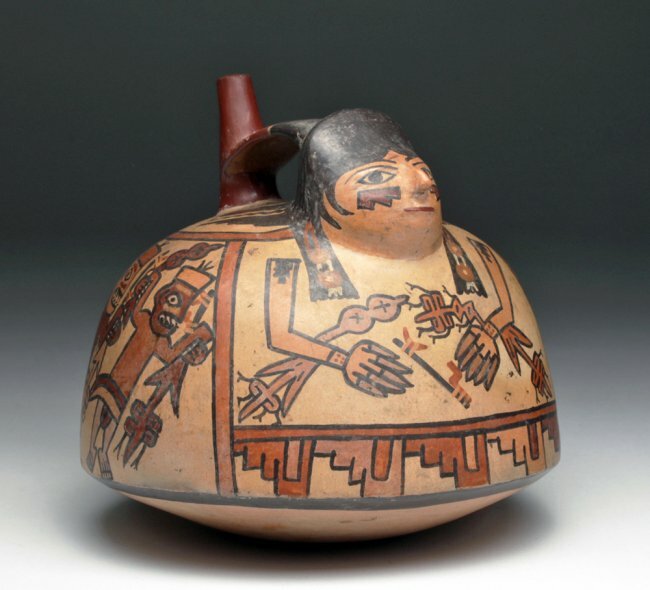 ‘Double figure, male adult with child, Alamito,’ ca. 1200 BCE, Throckmorton Fine Art. 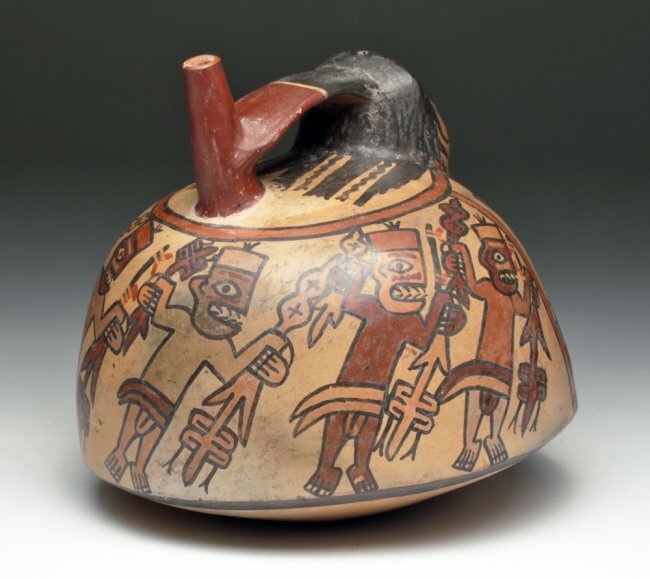 ‘Dog Effigy Vessel with Removable lid section’, Maya polychromed ceramic. Throckmorton Fine Art. Virgin and Child, late 13th century. Mosan (Valley of the Meuse), Liège(? ), painted and gilded oak, 32.8 x 9.4 x 6.7 in. The Cleveland Museum of Art. 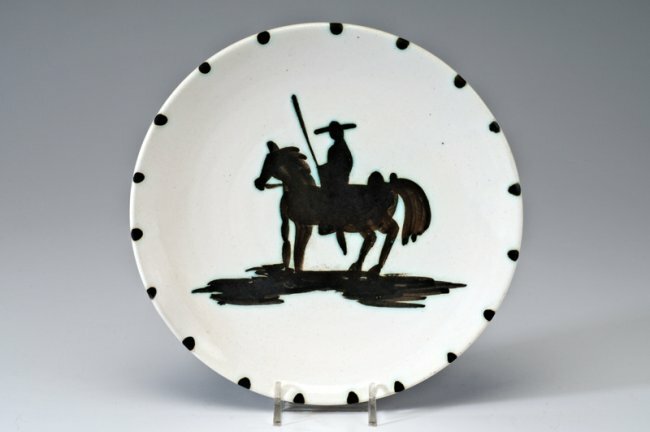 CLEVELAND, OH.– Recent additions of artwork representing medieval Europe, the Ancient Americas, 20th-century photography and contemporary art further enhance the Cleveland Museum of Art’s permanent collection. World-renowned for its quality and breadth, the collection represents almost 45,000 objects and 6,000 years of achievement in the arts. 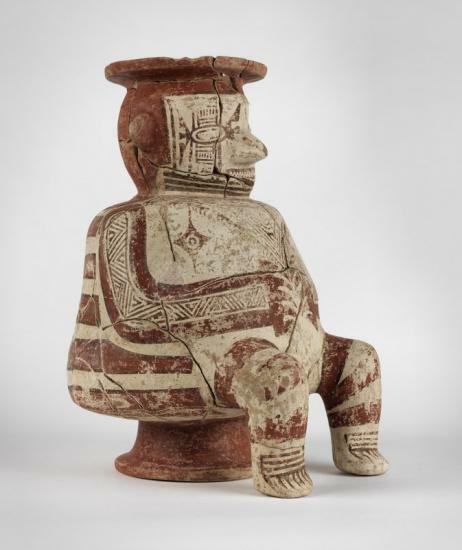 The latest acquisitions include a Virgin and Child, a rare 13th-century wooden sculpture from the Mosan region of Europe; a Standing Female Figure, a clay figure representative of the Classic Veracruz period on Mexico’s Gulf Coast; and Just the two of us, one of contemporary artist Julia Wachtel’s first paintings to employ cartoons. The museum also announced the addition of eight photographs by Ansel Adams, a gift from Frances P. Taft, a longtime museum supporter and trustee. This sculpture is a rare survival in wood from the Valley of the Meuse, an important region noted for the production of ecclesiastical art. 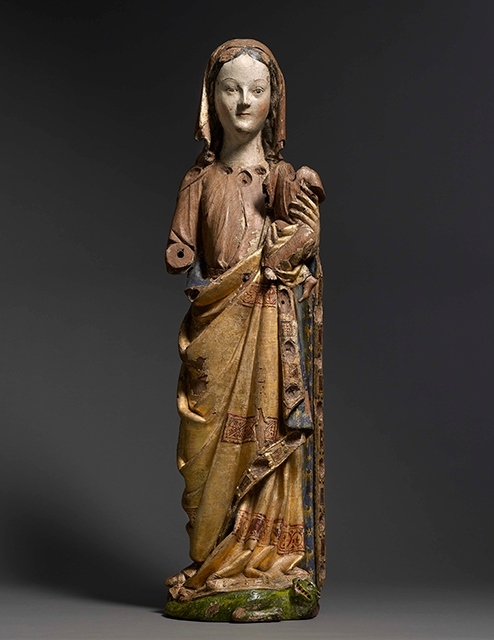 Only eight such figures of the Virgin and Child in wood are known to be extant from the Mosan region, the geographical area of modern-day France, Belgium and Holland through which the river Meuse flows. A prosperous and dominant artistic center during the 12th and 13th centuries, the region was among the key European trade routes and was noted for the presence of numerous wealthy abbeys, churches and convents, most of which were major patrons of ecclesiastical art. The Virgin and Child is elegantly draped and remarkable for the preservation of much of its original painted decoration and gilding. This includes the gilded mantle highlighted with decorative bands of geometric patterns and the green dragon on which she stands. The Virgin’s serene features and beautiful countenance are noteworthy as is the refined execution of the draperies, especially visible in the way the heavy cloth of her mantle falls in fluid and balanced folds at her feet. The carving is of the highest quality and the figure is an example of the finest Mosan sculpture of the 13th-century. This work will be on view in the museum’s medieval galleries beginning late January, 2015. 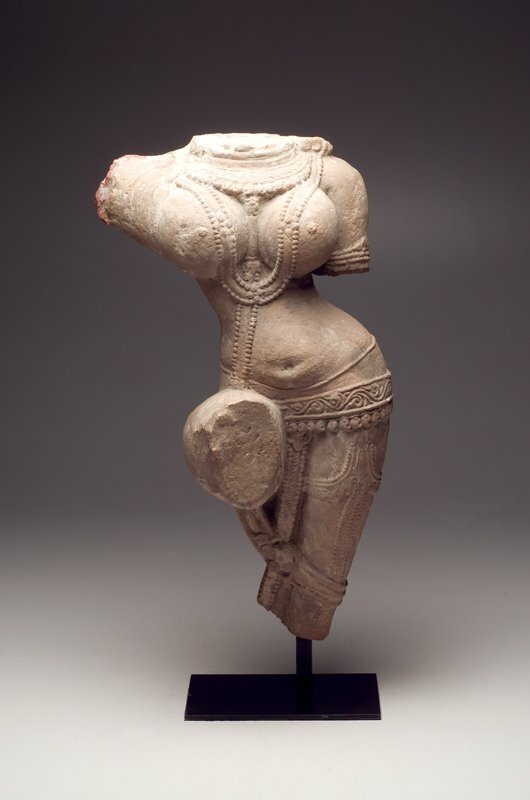 Standing Female Figure, c. 600-1000. 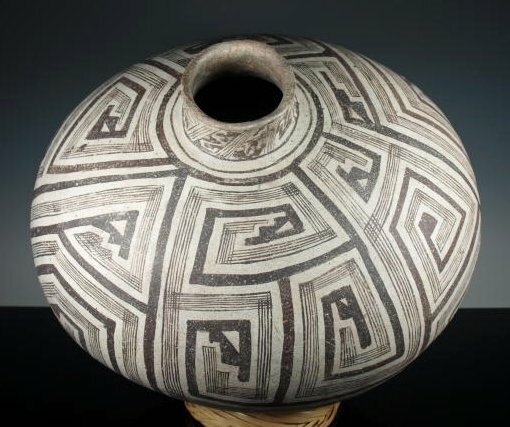 Mesoamerica, Classic Veracruz, Nopiloa style(? 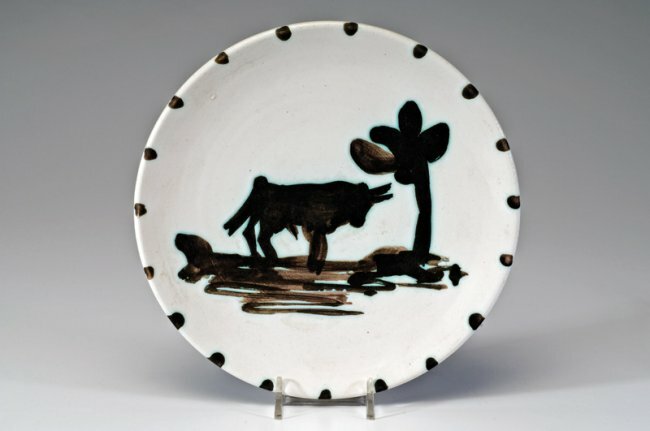 ), ceramic, pigment, 10 x 10.9 in. The Cleveland Museum of Art. 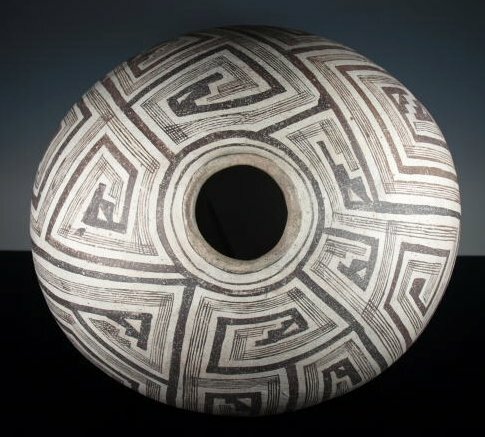 Clay was the primary artistic medium in ancient Veracruz on Mexico’s Gulf Coast, and artists of the Classic period (300–1000 AD) used it to create thousands of figural sculptures in a wide range of sizes, styles and types. 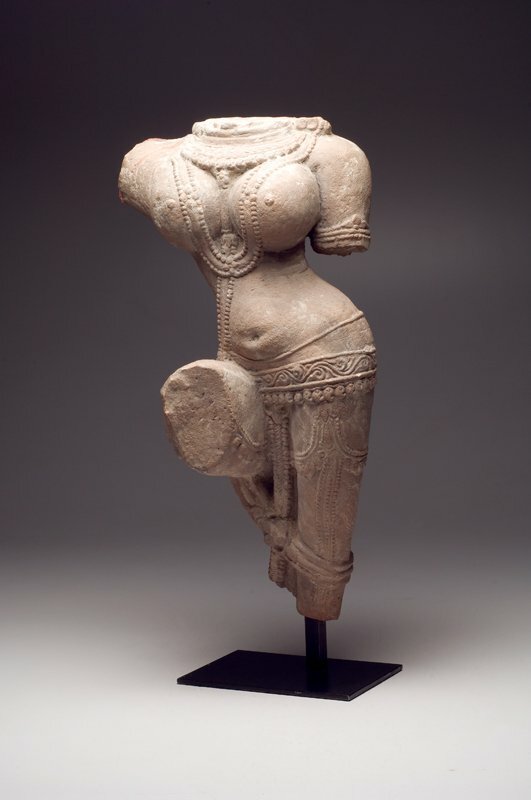 This beautiful Standing Female Figure is an exceptionally fine example. The figure’s head and turban-like headdress project three-dimensionally above a flat, plaque-like body supported at the rear by a tripod. 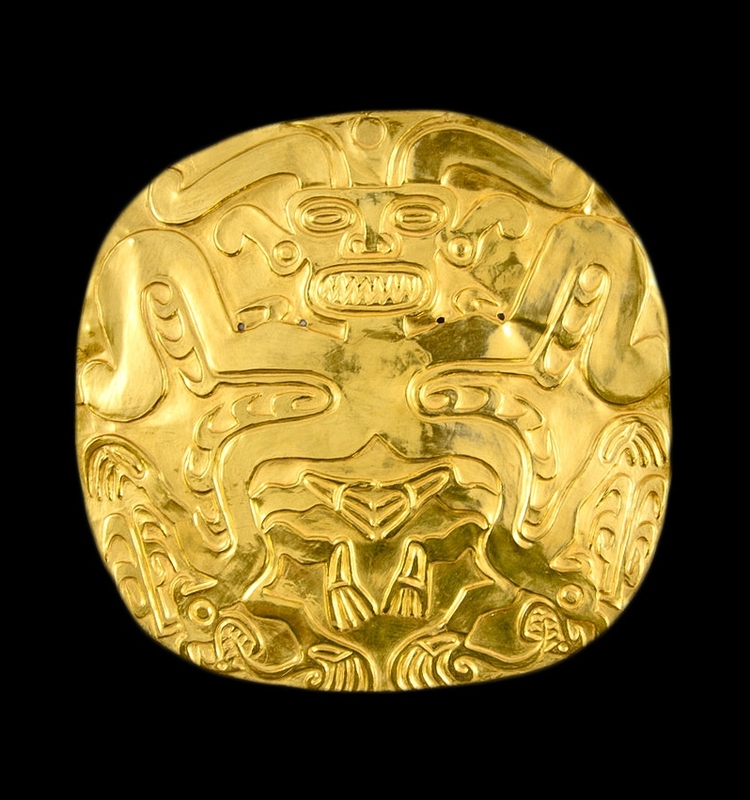 Her high status is signaled by her adornments: circular ear ornaments, a large necklace with oblong central pendant and elaborately decorated huipil (dress), which drapes over her outstretched arms to form a rectangle. Each of her long-fingered hands holds an unidentified plaited element that emerges from behind the head. Long tresses of hair fall to each side of the face, which has heavily lidded eyes and an open mouth with front teeth filed into a T or tau shape, which likely has symbolic import. 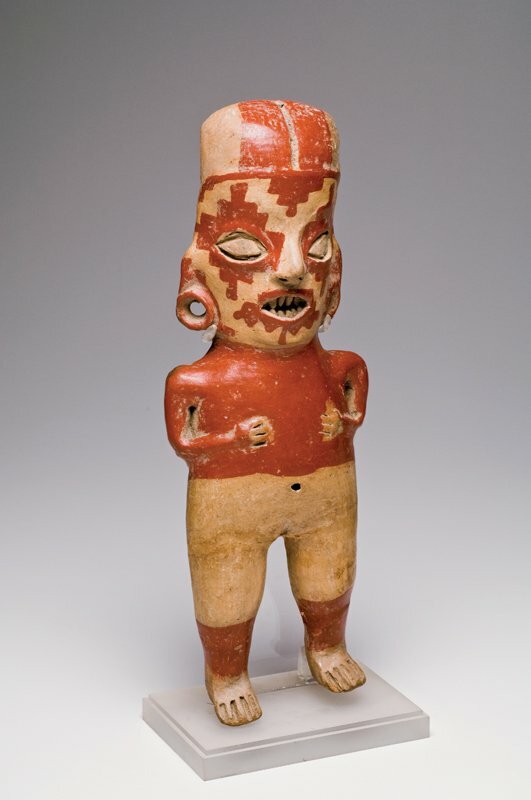 The figure’s closest stylistic affiliation is with a Veracruz style known as Nopiloa, which sometimes incorporates traits from Maya art and is noted for its refinement in modeling and iconographic detail. 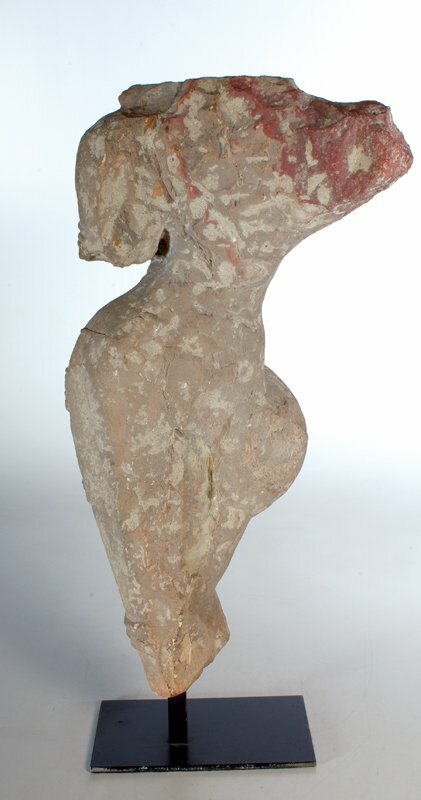 The unfinished back suggests that the figure was not meant to be seen in the round. An unusual amount of post-fire paint remains on the front, mainly white but also an earth red. 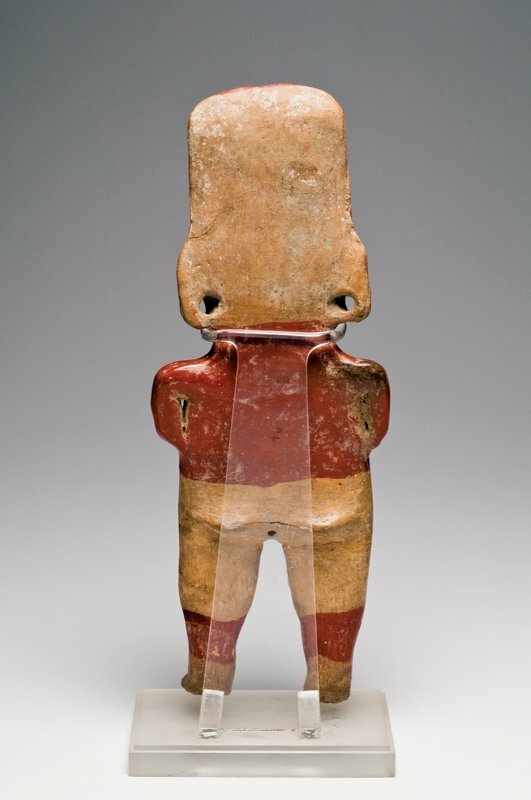 Standing Female Figure will be on view in the museum’s Pre-Colombian galleries in early 2015. Just the two of us, 1982. Julia Wachtel, American (1956 – ). acrylic on canvas, 73.9 x 77.9 in. The Cleveland Museum of Art. The acquisition of Just the two of us marks the occasion of Wachtel’s first institutional exhibition in more than two decades, Julia Wachtel, organized by the Cleveland Museum of Art. Emerging in the 1980s, Julia Wachtel became known for her paintings that employ cartoon characters appropriated from sources as everyday and relatable as greeting cards and magazines, deliberately commenting upon our quickly evolving visual culture. Often comprised of multiple panels, her later paintings also include pop stars, figurines from so-called primitive cultures and scenes from Hollywood films. In her work, Wachtel consistently displays a consciousness of the dominance of images, their penetration into all areas of human communication and the arbitrary ways in which they are juxtaposed in daily life. This consciousness—both before the internet era and in its wake—makes her work more relevant than ever. Just the two of us is one of Wachtel’s first paintings to employ cartoons. In it we see the back view of a young woman reading a letter. Her elaborate hair style and dress suggest a princess or an aristocratic lady of another era. This portrayal is reminiscent of Romantic imagery. It is coupled with another feminine archetype: a young, seemingly naive girl dressed in a school uniform with one stocking slipping down her leg. Both figures convey a certain passiveness and subordination to a (male) ideal conception of femininity. Both of these images were originally printed on greeting cards in the 1960s, which Wachtel found in the 1980s and appropriated to her own ends. 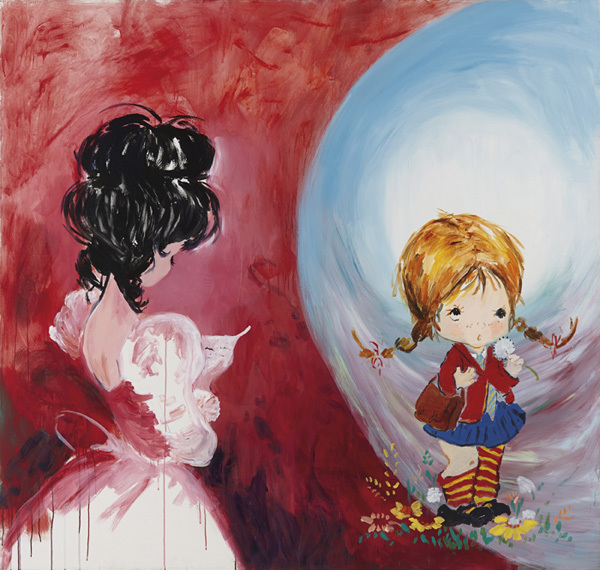 Wachtel’s forays into feminist critique are particularly poignant in some of her earliest paintings such as Just the two of us, aligning it with the works of other female Conceptual artists of that generation, including Ida Applebroog, Sarah Charlesworth, Sherrie Levine, Adrian Piper and Laurie Simmons – all of whom coupled high and low visual tropes with feminist analysis. Just the two of us articulates how ideas related to gender influence individuals as well as public opinion and calls into question the degree to which commercial imagery influences common behavior and norms. Just the two of us is currently on view in the CMA at Transformer Station exhibition Julia Wachtel until January 17, 2015. 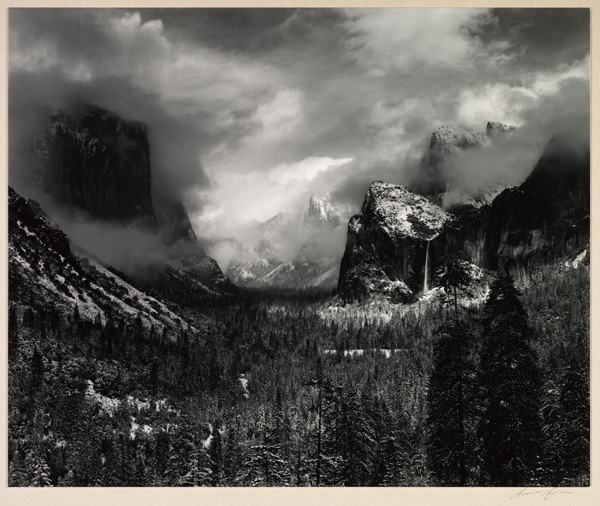 Winter Storm, from Yosemite Valley Portfolio III, 1960. Ansel Adams, American (1902 – 1984). gelatin silver print, paper and image 18.9 x 22.9 cm, mounted 35.7 x 45.8 cm. The Cleveland Museum of Art, , Gift of Frances P. Taft. Ansel Adams, an indisputable master of American landscape photography, had an enormous influence on future generations of photographers and also was a key figure in popularizing the medium of photography, the American National Park system and the environmental conservation movement. 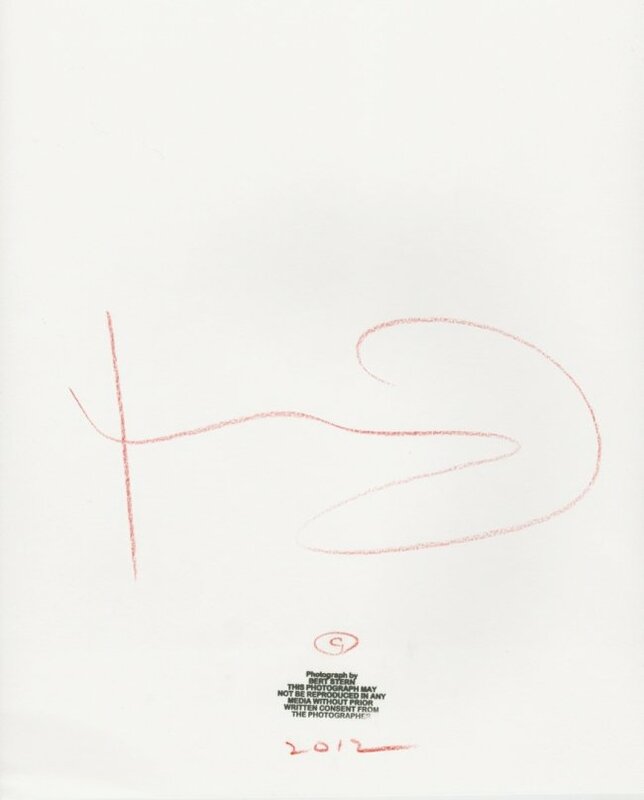 Between 1932 and 1976, he printed and issued seven portfolios of his work, carefully selecting the images to offer an excellent cross-section of his career. 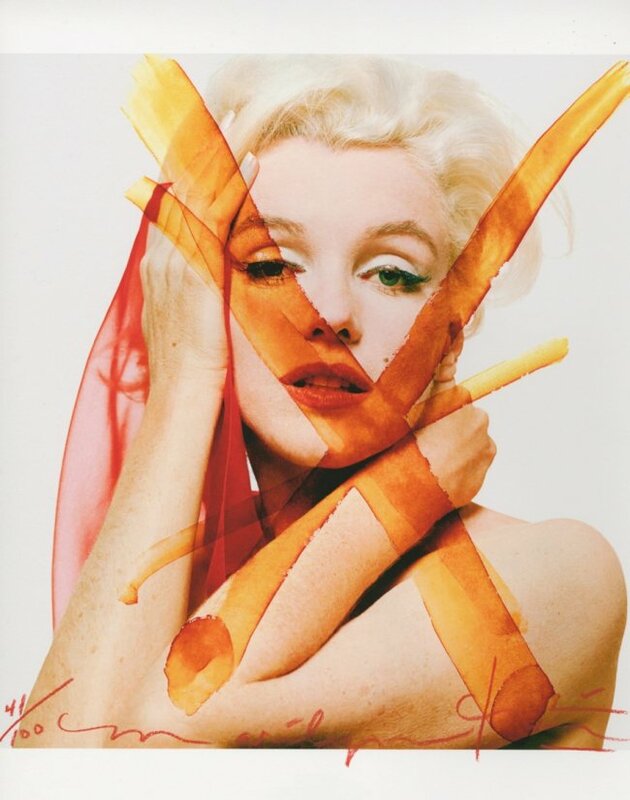 These prints were originally owned by noted Cleveland goldsmith and jewelry designer John Paul Miller, who studied photography with Adams and may have purchased the portfolio directly from the artist. The eight images were gifted by Miller to Taft. Rare and Important Aztec Diety Image of Xochipilli-Macuilxochitl, Late Postclassic, ca. A.D. 1450-1521. Light-green aragonite (Mexican onyx marble-tecali), height 12in (30.5cm); width 5 3/4in (19cm); depth 5 1/2in (14cm). Estimate US$ 80,000 – 120,000 (€63,000 – 95,000). Photo: Courtesy of Bonhams. 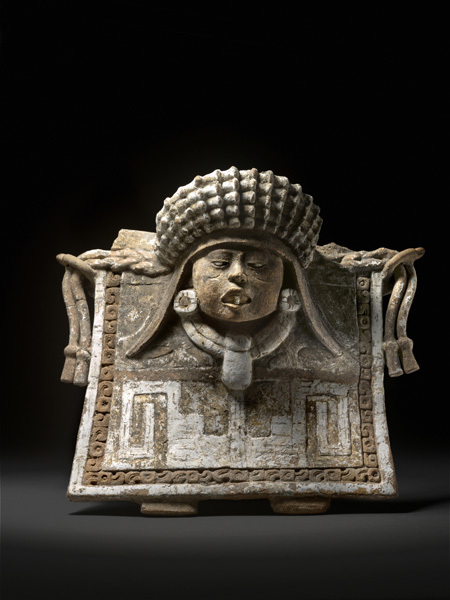 NEW YORK, NY.- Bonhams will offer an important collection of Pre-Columbian art in the auction of African, Oceanic & Pre-Columbian art to be held in New York on November 12. 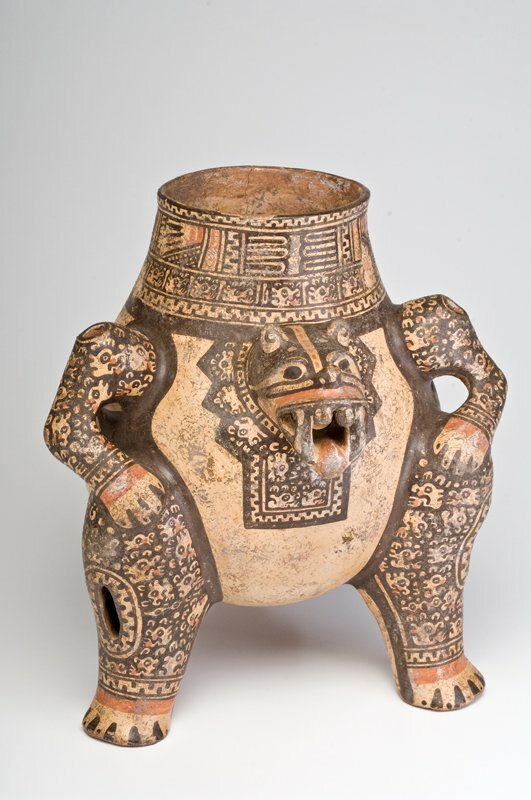 An important featured lot is a rare Aztec Deity of Xochipilli-Macuilxochitl from the Late Postclassic period, circa. A.D. 1450-1521 (est. $80,000 – 120,000). 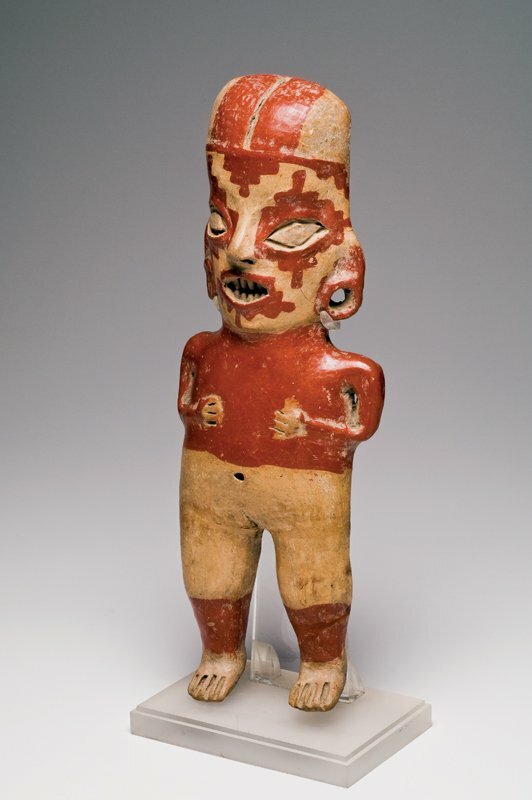 Xochipilli was celebrated by the Nahua Aztecs during at least two important feasts, the small feast day of the lords, which nobility attended; and the feast of flowers that invited painters and seamstresses. 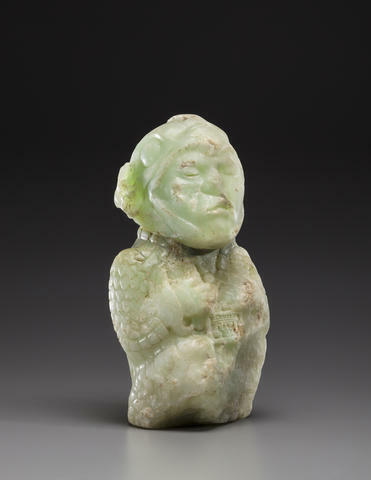 The figure is made from a light-green aragonite that depicts Xochipilli wearing the headdress of the crested coxcoxtli, a bird whose open bill frames his face and feathers wrap around Xochipilli’s form like a garment. 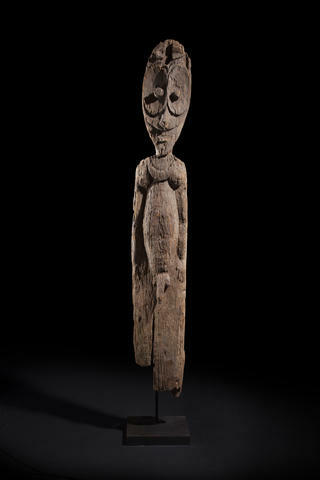 From Papua New Guinea is an exceptional Sawos Ancestral Guardian Male Figure, estimated to fetch between $40,000 and 60,000. The wooden figure towers at 83 inches and has a large oblong head from which bulbous tubular eyes protrude. 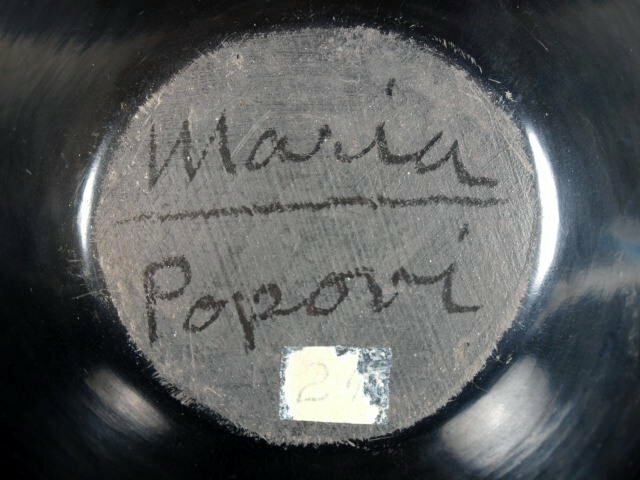 It was once in the prestigious collection of Marcia and John Friede. Large Sawos Ancestral Guardian Male Figure, Middle Sepik River, Papua New Guinea, mian’gandu. Wood, height 83in (211cm). Estimate US$ 40,000 – 60,000 (€32,000 – 47,000). Photo: Courtesy of Bonhams. 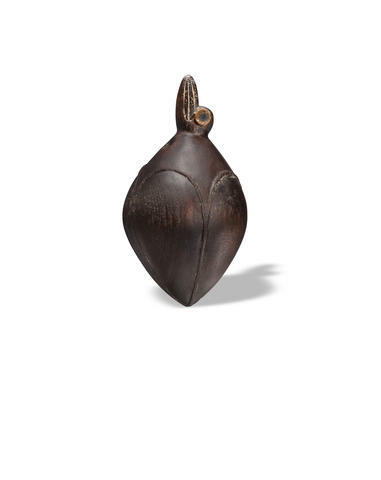 A selection of pieces fresh to the market include a fine and extremely rare Bird Pendant from Easter Island (est. 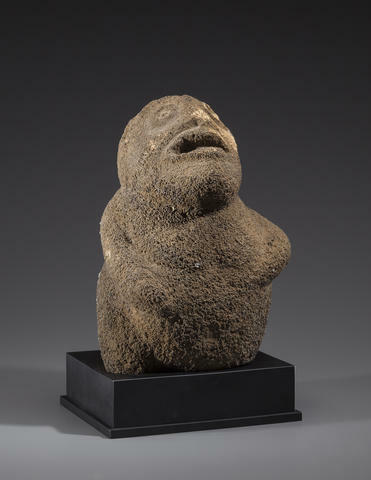 $8,000-12,000) that boasts an exceptional reddish-brown patina, a finely carved ovoid form that portrays a bird halfway hatched from an egg; a rare stone God Image from Ra’ivavae in the Society Islands (est. 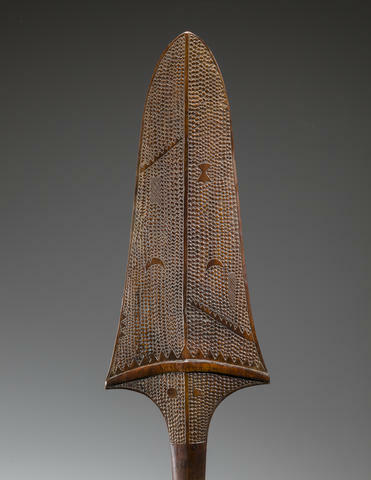 $8,000 – 12,000), whose stylized facial features gaze upward with an open mouth; and a fine and rare Parrying Shield from the Tonga Islands (est. $12,000-18,000), which used to serve as a weapon as well that was carried by priests and chiefs. 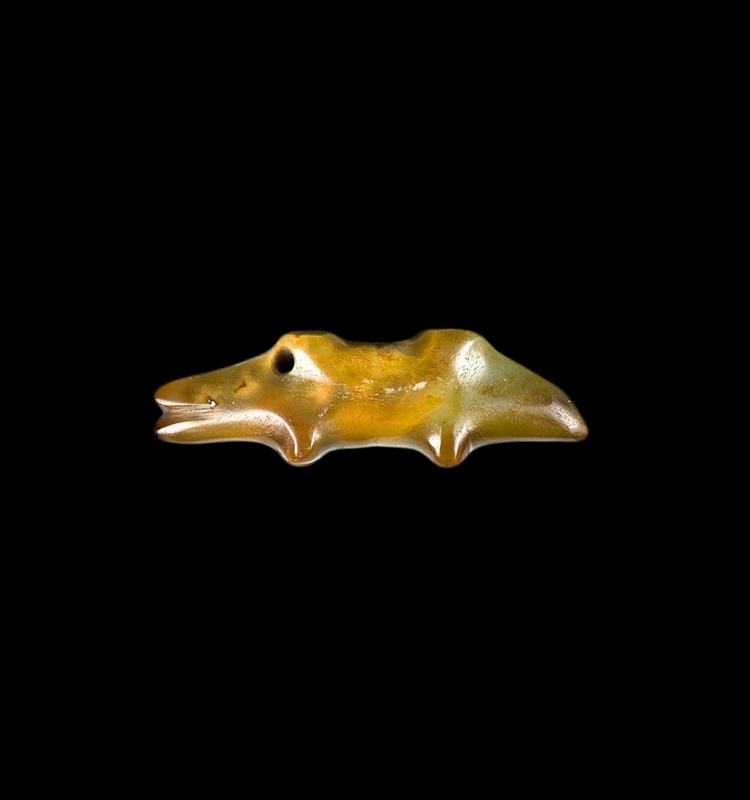 Fine and Extremely Rare Bird Pendant, Easter Island, tahonga. Wood, bone (Mammalia sp. 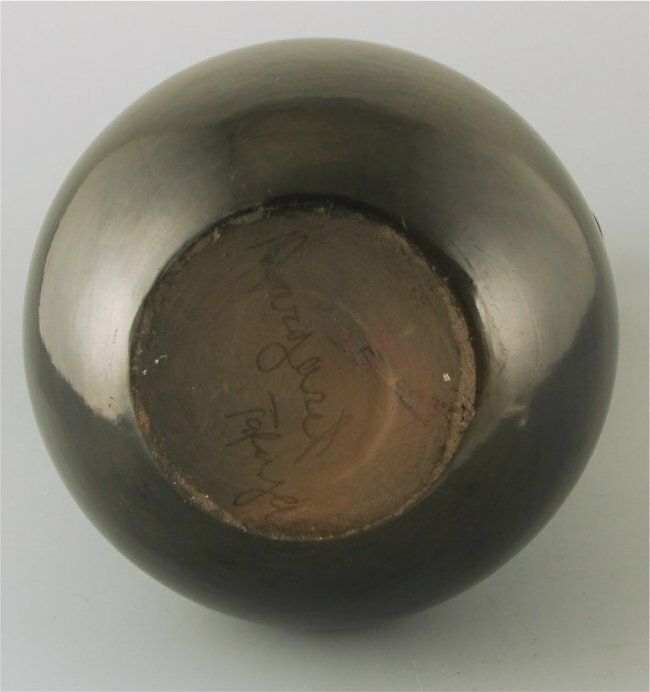 ), shell, obsidian, pigment, length 5 1/8in (13cm). Estimate US$ 8,000 – 12,000 (€6,300 – 9,500). Photo: Courtesy of Bonhams. Rare God Image, Ra’ivavae, Society Islands. 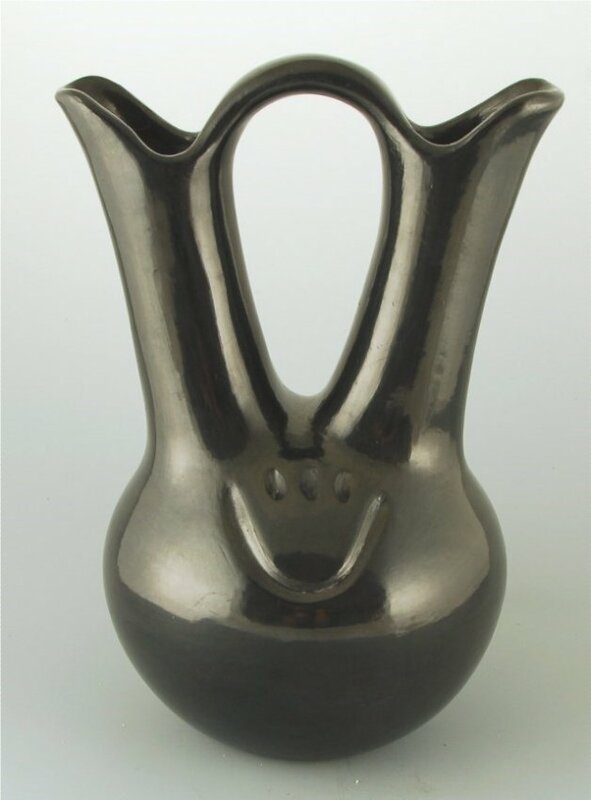 Gray stone (probably basalt), height on stand 20in (51cm). Estimate US$ 8,000 – 12,000 (€6,300 – 9,500). Photo: Courtesy of Bonhams. 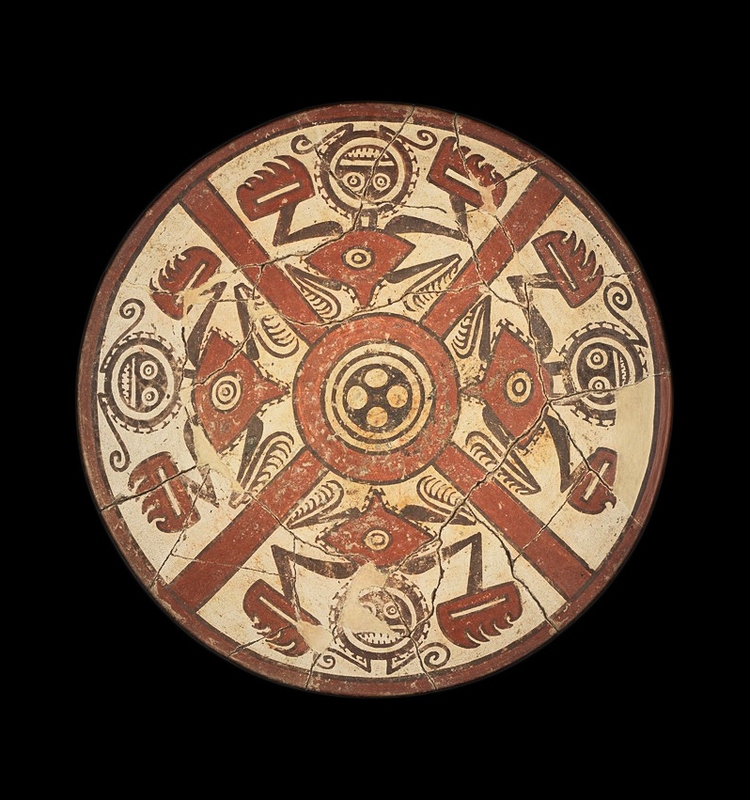 Fine and Rare Parrying Shield, Tonga Islands, Culacula. Wood, length 44 1/2in (113cm). Estimate US$ 12,000 – 18,000 (€9,500 – 14,000). Photo: Courtesy of Bonhams. 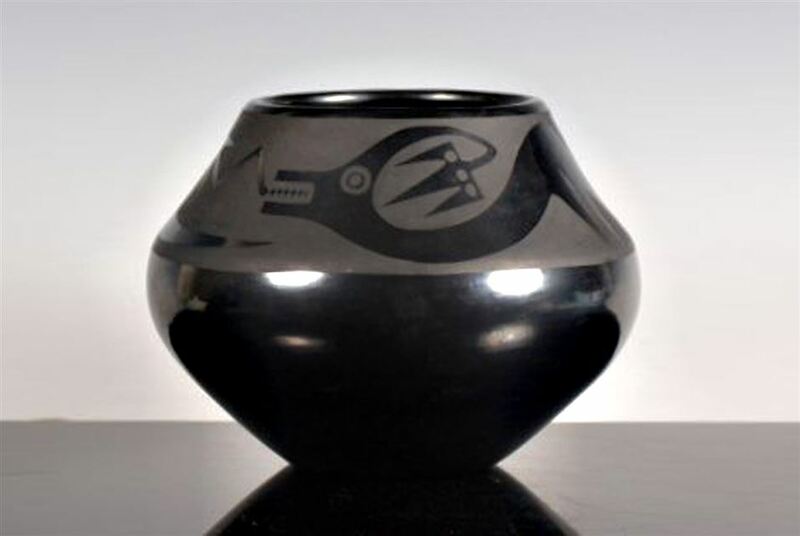 A small and tasteful selection of Tribal Art from the Collection of Ben-Zion, a New York City based artist and writer who was a member of the expressionist group « The Ten, » which included Mark Rothko and Adolph Gottlieb, will also be on offer. 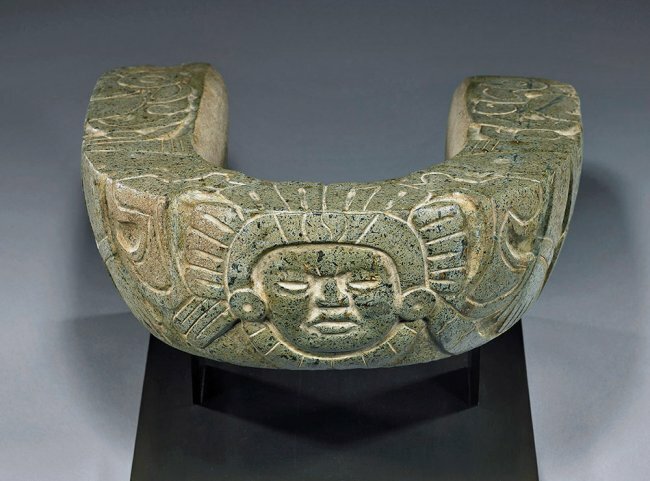 A prominent section in this auction features the highly acclaimed, single-owner collection of roughly 130 Pre-Columbian works of art from Mesoamerica from the Collection of Scott Gentling and Stuart Gentling. 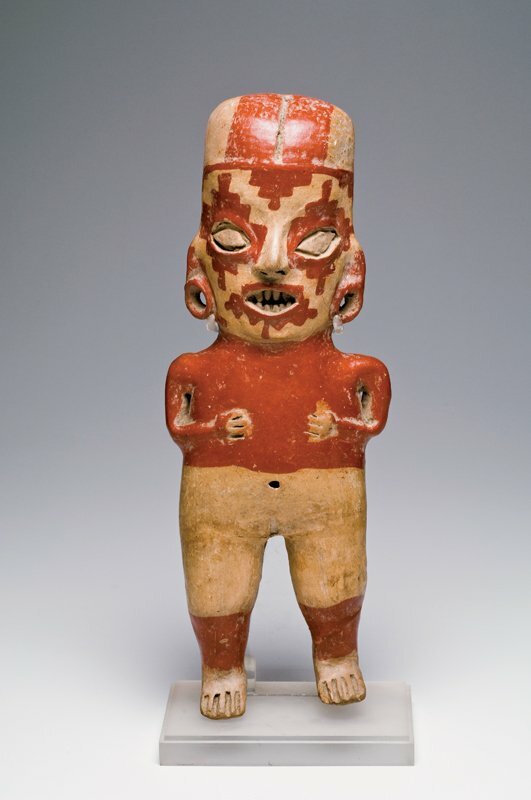 Large Aztec Standing Figure of Teteoinnan-Chicomecoatl, ca. A.D. 1470-1521. Est. $15,000 – 20,000. Photo: Bonhams. 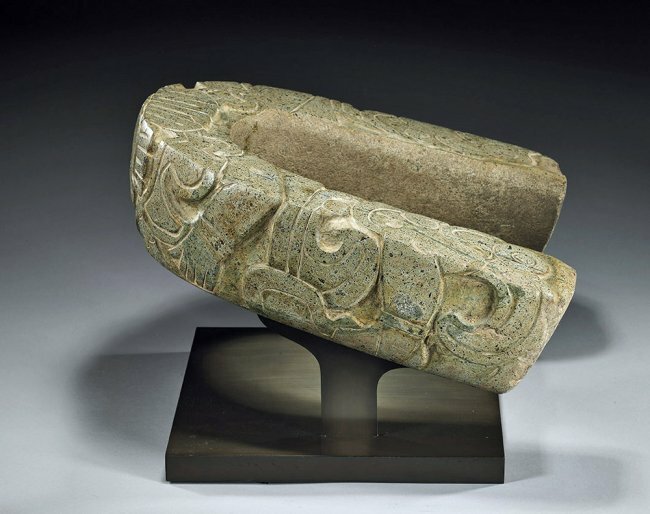 New York – The African, Oceanic & Pre-Columbian auction to be held in New York on November 12 will feature an important collection of pre-Columbian art. 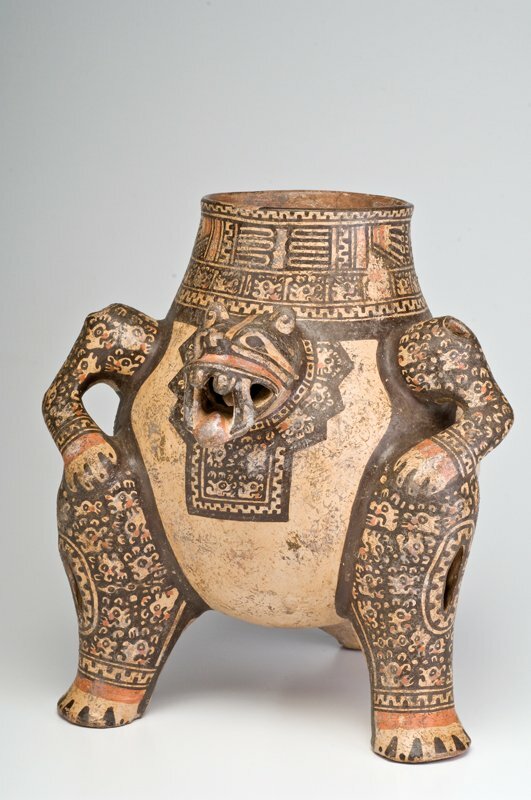 The highly acclaimed, single-owner collection of roughly 130 Pre-Columbian works of art from Mesoamerica from the collection of Scott Gentling and Stuart Gentling will be offered for sale. 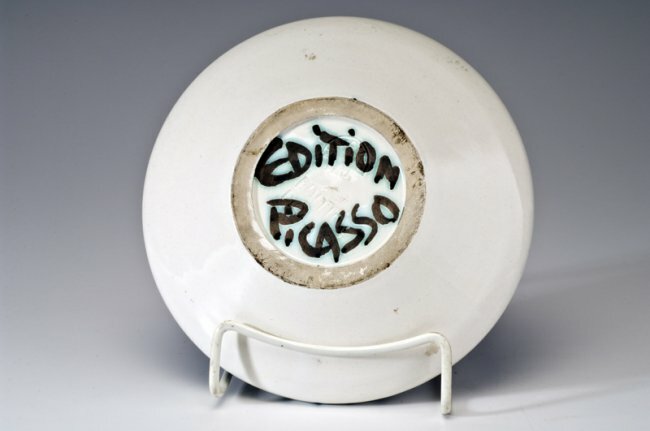 The concentration of the collection is on works produced in the Late Postclassic International style, perhaps the single most significant collection ever assembled. Scott and Stuart Gentling were both accomplished artists renowned for their skill at realistically capturing both human and animal subjects through portraiture. Their 1986 volume, « Of Birds and Texas, » achieved after more than twenty years of research, is widely regarded as an American masterpiece. But it was the account of the Conquest of Mexico by Bernal Díaz del Castillo that fired the imagination of both Scott and Stuart, who said, « After reading the book we wanted to see Tenochtitlan, Cholula…and all of these ancient cities but in order to see them we had to build them. » The brothers had been able to achieve such a high degree of realism in their painting through the use of architectural models that they had constructed of paper and board. A star lot from this selection is an Aztec Relief Panel with Warrior Figure dated circa 1300-1521 (est. $30,000 – 50,000). The 22 inch-tall panel is made from volcanic rock and carved in high relief in the Mixteca-Puebla International style of southern Mexico. He is grasping a spear and shield in his right hand and wears a tunic called a xicolli which was worn primarily by Mixtec kings but also Aztec priests. A Large Maya Female Dignitary (est. $20,000 – 40,000) is another highlight. The Jaina figurine is incredibly old, having been sculpted circa A.D. 550-950, and is made from clay with yellow and blue pigment highlights. The female figure stands confidently in an animated pose with her feet arched and broadly separated, her right arm raised, and her left held in front of her. 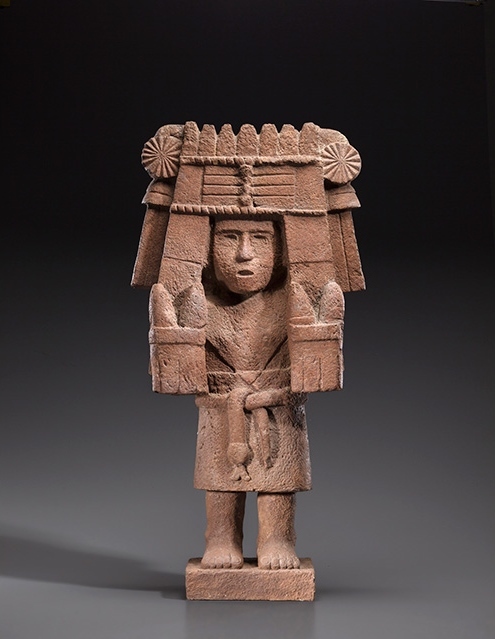 A notable item in the auction is a Large Aztec Standing Figure of Teteoinnan-Chicomecoatl (est. 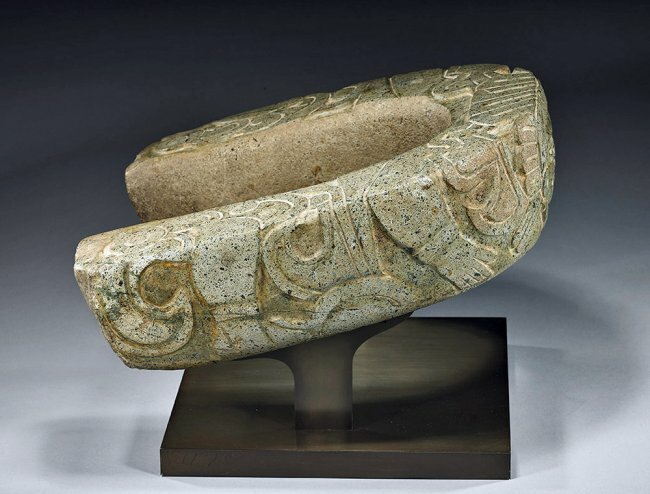 $15,000 – 20,000) made from red volcanic stone, which was created circa A.D. 1470-1521. Chicomecoatl (Lady Seven Serpent) is the goddess of sustenance. 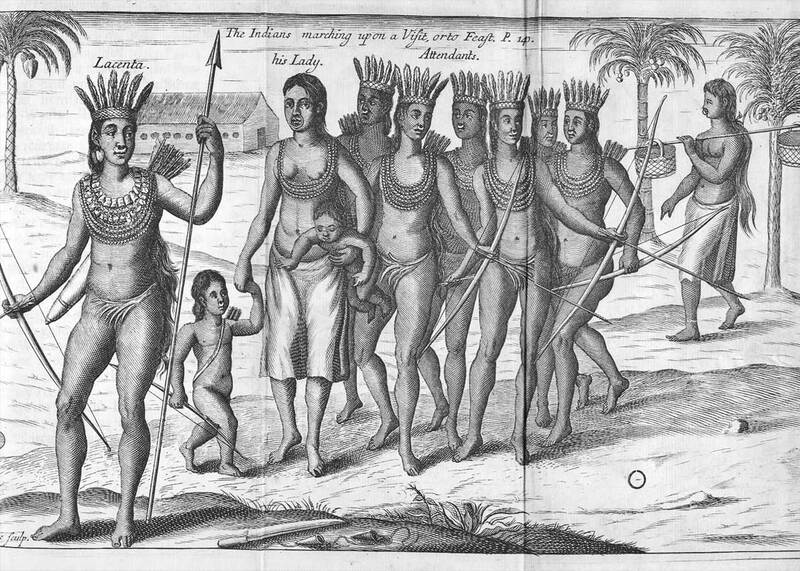 She is shown standing, wearing a long skirt held in place with a snake as a belt, and holds two maize ears in each hand. réalisé à partir d’épais segments de feuilles d’or rectangulaires, décor d’une petite rosette au repoussé sur chaque bracelet, 4 petits trous percés pour fermeture, 103 g., 850/1000, larg. 7 cm. HÔTEL DES VENTES DE GENÈVE, Archéologie, 7 Octobre 2014 à 19H. 51, RUE PRÉVOST-MARTIN – 1205 GENÈVE. Tel: +41 22 320 11 77.